The λCDM model of cosmological structure formation has very successfully matched many observational aspects of the Universe. However, the nature of the main ingredient of this model — the so-called Dark Energy — is currently still a mystery. Scientists at the Max-Planck-Institute for Astrophysics have recently performed the largest ever computer simulation of cosmic structure formation. Combined with new observational campaigns, this might help to constrain the properties of the Dark Energy and solve one of the most important puzzles in modern cosmology. Fig. 1: The mass density field in the Millennium-XXL focusing on the most massive halo present in the simulation at z=0. Each inset zooms by a factor of 8 from the previous one; the side-length varies from 4.1 Gpc down to 8.1 Mpc. All these images are projections of a thin slice through the simulation of thickness 8 Mpc. Fig. 2: The predicted galaxy distribution in the Millennium XXL simulation. Each galaxy is represented by a sphere, whose intensity and size are related to the expected total mass in stars and the size of its cold gas disk, respectively. 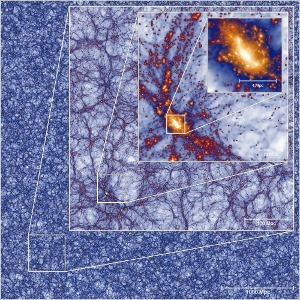 Over the last two decades, cosmological numerical simulations have played a decisive role in establishing the λCDM paradigm as a viable description of the observable Universe. For instance, they allow astronomers to explore the impact of the different aspects of this standard model on the spatial distribution of galaxies, which can then be directly compared with observation to validate or rule out a particular model. 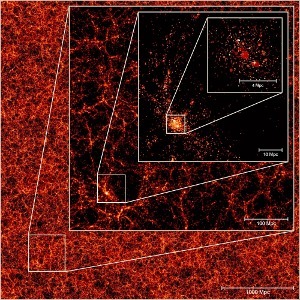 Similarly, such simulations have proven to be an indispensable tool in understanding the low- and high-redshift Universe, since they provide the only way to accurately predict the outcome of non-linear cosmic structure formation. 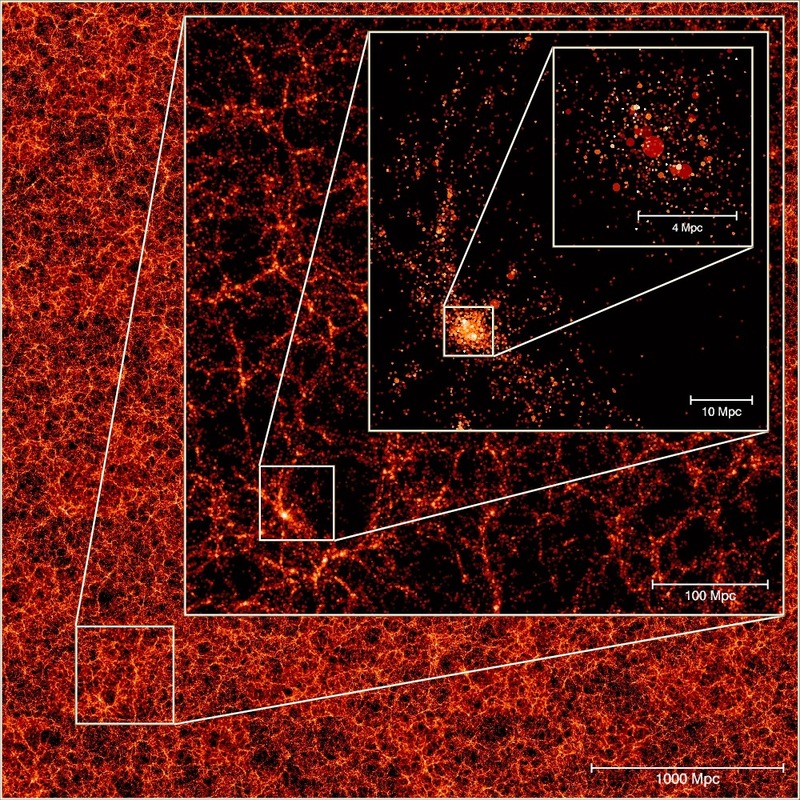 Scientists at the Max-Planck-Institute for Astrophysics, together with collaborators in the Virgo consortium, have recently completed the largest cosmological N-body simulation ever performed. This calculation solved for the gravitational interactions between more than 300 billion particles over the equivalent of more than 13 billion years, thus simultaneously making predictions for the mass distribution in the Universe on very large and very small scales. Carrying out this computation proved to be a formidable challenge even on today's most powerful supercomputers. The simulation required the equivalent of 300 years of CPU time and used more than twelve thousand computer cores and 30 TB of RAM on the Juropa Machine at the Jülich Supercomputer Centre in Germany, one of the top 15 most powerful computers in the world at the time of execution. The simulation generated more than 100 TB of data products. This new simulation, dubbed the Millennium-XXL, follows all 6720³ particles in a cosmological box of side 4.1 Gpc, resolving large-scale structure with an unprecedented combination of volume and detail. The enormous statistical power of the simulation is hinted at in Fig 1, which shows the projected density field on very large scales and for the largest cluster found at z=0. 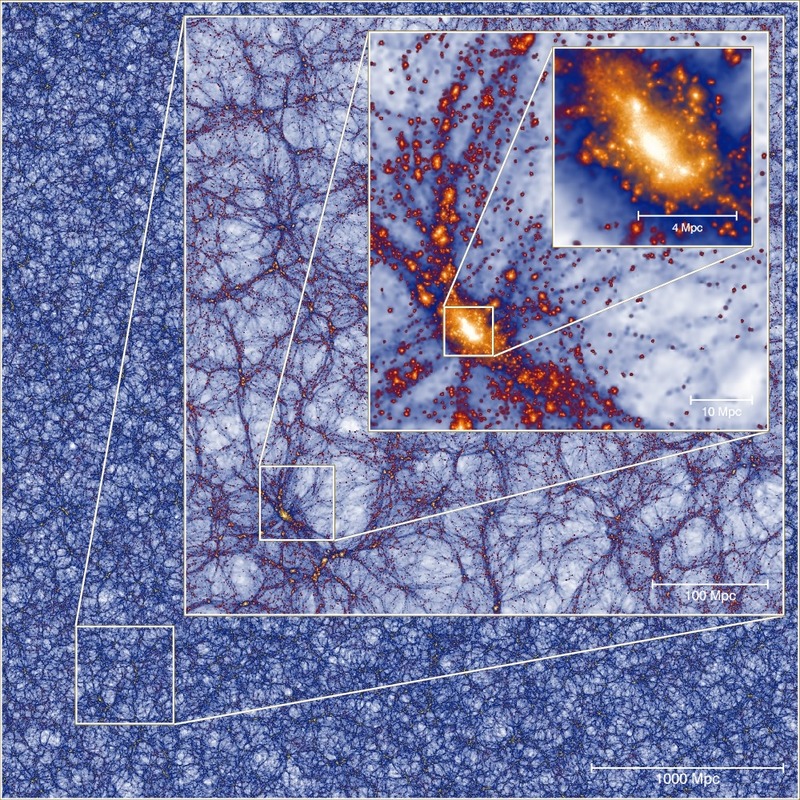 The simulation has been used to model galaxy formation and evolution, providing a sample of around 700 million galaxies at low redshift, whose distribution is displayed in Fig. 2. This allows detailed clustering studies for rare objects such as quasars or massive galaxy clusters, and also new ways to physically model observations. In particular, the scale-dependent relation between galaxies and the underlying dark matter distribution, and the impact of non-linear evolution on the so called baryonic acoustic oscillations (BAOs) measured in the power spectrum of galaxy clustering can be addressed in a fully physical way for the first time. This work is expected to be crucial in understanding new observational data, whose aim is to shed light on the nature of the dark energy via measurements of the redshift evolution of its equation of state. In particular, the arrival of the largest galaxy surveys ever made is imminent, offering enormous scientific potential for new discoveries. Experiments like SDSSIII/BOSS or PanSTARRS have started to scan the sky with unprecedented detail, considerably improving the accuracy of existing cosmological probes. These experiments, combined with theoretical effors like the newly performed simulation, will likely lead to challenges to the standard λCDM paradigm for cosmic structure formation, and perhaps even to the discovery of new physics. Raul Angulo & Simon White.